Software to quickly and automatically submit your website to over 1,750 resources (directories, classified sites, free-for-all link pages ("FFA"s), and other sites), and 250 search engines. For most affiliate, Adsense, and small-business websites, your profit margins are razor thin and you can't afford to spend much money advertising. Instead, you've got to get your pages into the search engines, and then get the free search engine traffic flowing. Additionally, you can also let people know about your site through free listings in directories and classified sites. When you say "search engine", most people temd think of the big search engines: MSN, Yahoo, and, of course, Google. But it is also true that a fair amount of traffic also goes through all of the small the search engines, and could potentially bring visitors to your site. Additionally, many directories tend to have decent amounts of search engine traffic running through them (thanks to having many top rankings), which again can be directed towards to your site. However, one problem is that finding these free sites to submit to can quite challenging, and individually each one, may not make that much of a difference. To make a real impact, you need to submit to a lot of them. Submit Equalizer sets-out to eliminate these challenges by automatically submitting your sites to hundreds of smaller search engine, and hundreds more directories, and classified sites. According to the software's developers, one advantage of using Submit Equalizer over competitors who listed many hundreds of thousands of sites, is that Submit Equalizer only submits to sites specifically chosen to be likely to produce results, rather than making pointless submissions to many more useless and low-quality sites. Of course search engine marketing is constantly changing, so results may vary, but the authors of program say that after using the softwar you should see a surge of search engines spiders (which means more pages are likely to be indexed inside), hopefully a few of backlinks inside Google, and of course, increased exposure. In terms of using the software, it should be easy. Most of the submission sites can be submitted to with a single click of a button. However, there are about 42 sites that require manual submission - for these, Submit Equalizer has a built in web-browser, and provides a semi-automatic solution. In short, if you are looking for software for website submission, Submit Equalizer might be what you are looking for. 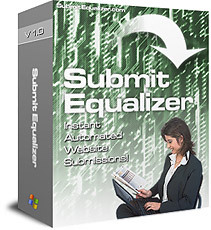 This vendor sells Submit Equalizer through ClickBank (other options may also be available on the vendor's site). ClickBank accepts payments made using most major credit and debit cards, as well as using PayPal. You can pay for Submit Equalizer using any of these methods. Although some payment options may not be available for all customers. To purchase this product via ClickBank, simply click through to the Submit Equalizer website and follow the payment or ordering instructions. In the case of most vendors, there should only be one Order/Payment/Add-to-Cart button which will then lead you to the ClickBank secure order form. If however the vendor offers a choice of payment methods, make sure you choose ClickBank. If you are unsure, or are unable to locate the ClickBank payment button, you should contact the vendor before ordering. Disclosure: Our company may receive a payment if you purchase third party software, products or services (including Submit Equalizer) after following a link from this website. Information about third party products and services is based on information provided by the vendor and/or publicly available information, and should not be taken to mean that we have purchased, used or tested the product/service in question. Details of third party products and services may vary from time-to-time, and while information on this site is believed to be correct when first published, we can not guarantee that it still current: vendors may vary their products without notifying us - please therefore check the vendor's sites for current details of their products/services.